Wuwei camellia, a species lost for over 70 years after its original description, is endemic to Southern Taiwan. When the species was first described it was placed in the genus Camellia, yet as the material used to describe the species was lost and as developments in plant systematics occurred there was some disagreement about exactly which genus the species belonged in. 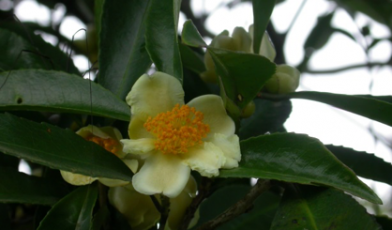 Upon it’s rediscovery in 2004 during a vegetation survey, the identity of the species was clarified and it was discovered that the wuwei camellia belongs in the genus Pyrenaria, a closely related genus to Camellia. Along with the clarification of the name of this species, P. buisanensis, comes an understanding of the conservation status. This species is identified as Critically Endangered on the IUCN Red List, due to its small population size within only three localities of Southern Taiwan. 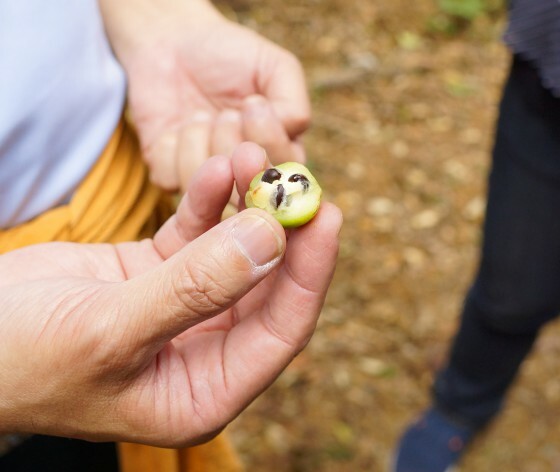 Historical logging of the current habitat of wuwei camellia has threatened the species leaving the small population that exists today. The flowers of P. buisanensis, an evergreen tree that can grow to 15m, are also known to be used for making tea and as a result may become more threatened through the increased use of the species. Fruit and seeds of Pyrenaria buisanensis. Recent surveys of the known localities of P. buisanensis showed that some trees had also been subject to crown damage and that few small saplings were present in the wild, indicating potential barriers to reproduction in the wild. GTC partners at the Dr. Cecilia Koo Botanic Conservation Center (KBCC) and the National Museum of Natural Science (NMNS) in Taiwan are working to conserve P. buisanensis through the collection of seed and propagation of genetically representative ex situ conservation and display collections within botanic gardens to raise awareness of this threatened, endemic species of Taiwan. Rivers, M. et. Al. In Press. Pyrenaria buisanensis. The IUCN Red List of Threatened Species. Su, M-H., S.-Z. Yang and C.-F. Hsieh. 2004. The Identity of Camellia buisanensis Sasaki (Theaceae). Taiwania, 49(3): 201-208. During World War II, most of the specimens from the first collection of Erythrina schliebenii were destroyed when the Berlin Herbarium caught fire during a bombing raid.